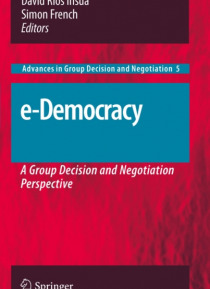 We are all aware of political imperatives towards e-government and public participation which, together with pressures from the information and communications industry to sell their wares, mean that e-participation and e-democracy are coming, and coming fast, whether or not the processes involved are meaningful and valid. Indeed, the bulk of research in the field concentrates mainly on technologie… s to facilitate or automate standard democratic instruments. Typical examples include technologies of e-voting, which essentially refer only to facilitating voting through electronic means, and technologies of e-deliberation, which facilitate debate of issues through the web. We are concerned that political and commercial imperatives towards the adoption of e-participation might lead to their use before we understand what they are actually achieving.Drawing on the experience accumulated from our previous research, we believe that the GDN community may have a lot to contribute and improve the current status, through the use of web-based decision and negotiation analysis tools to structure and articulate participative deliberations. We shall describe a general framework and architecture for e-participation and analyse in detail the required modules to implement such architecture, together with viewpoints referring to how may we support unsophisticated users to conduct, or at least explore, decision analysis; to discover and build consensus; on how to facilitate large, diverse, dispersed, multi-cultural groups, many of whom may share few common values, possibly interested in different decision methodologies. We also illustrate with several relevant case studies how such framework may be implemented. It behoves the GDN community to lead the debate and conduct the research to address these questions, so that society uses e-participation wisely, possibly through the type of architectures we propose.